The Office of High Sheriff is at least 1,000 years old having its roots in Saxon times before the Norman Conquest. Originally the office (Shire Reeve) held many of the powers now vested in Police, Lords-Lieutenant, High Court Judges, Magistrates, Local Authorities, Coroners and even the Inland Revenue. The Shrievalty is the oldest secular office after the Crown and the area for which a Sheriff is appointed is usually called his/her "Bailiwick". The High Sheriff remained first in precedence in the counties until the reign of Edward VII when an Order in Council in 1908 gave the Lord-Lieutenant the prime office under the Crown as the Sovereign's personal representative. Appointed annually in April, the High Sheriff remains the Sovereign's representative in the county for all matters relating to the judiciary and the maintenance of law and order. The High Sheriff of Lincolnshire for 2005-2006 – Nigel Brown and listed for 2006-2007 Roger Douglas. The High Sheriff can be contacted through the Under Sheriff's Office (see below). The Shrievalty in Lincolnshire was interrupted in 1974 when the County of Humberside took over the complete northern part of the county and 8 High Sheriffs of Humberside were in office for the whole of that county. This was abolished in 1996 and the northern bailiwicks reverted to Lincolnshire once more. In counties visited by High Court Judges the first and foremost task is in connection with these Judges. The Sheriff's duties are both official and unofficial. In some Parliamentary constituencies the High Sheriff retains a right in relation to Parliamentary elections to receive the Writ and to declare the result. Until 1st April 2004 the Sheriff was still responsible for the enforcement of most High Court Writs which are processed through the Under Sheriff's office, and the execution of Warrants are then carried out by the Sheriff's officers. Now he has been removed from this obligation and it will be carried out by “enforcement officers” appointed by the Lord Chancellor. Time will tell whether this is will be a cost effective move or merely a centralisation of powers. We would like to acknowledge the following for information and extracts. The foundations of Anglo-Saxon society rested on an unstable economy. Famines, plagues and pestilence were frequent and death from starvation was not uncommon. The cause lay in primitive methods of animal husbandry, the scarcity of arable land, hard winters. The peasants scratched the soil from dawn to dusk and were frequently attacked by bandits and rapacious neighbours! No man worked harder than the reeve, who had been chosen by a free peasant community to organize and supervise its communal activities. Their reeve became the lord's reeve and was placed in authority over all the peasants and lands in the lord's area of influence. The reeves' first duty was to ensure that both sides kept their bargains. Over a period the most important reeves were appointed as Kings or High Reeves and from this came his influence in the legal system. The name High Reeve was still in use in 1001 and the title "Sheriff" (Shire Reeve) does not occur until 1055. Originally the office held many of the powers now vested in Lord Lieutenants, High Court Judges, Magistrates, Local Authorities, Coroners and even the Inland Revenue. The Office of High Sheriff remained first in precedence in the Counties until 1908 when an Order in Council gave the Lord Lieutenant the prime office under the Crown as the Sovereign's personal representative. The High Sheriff remains the Sovereign's representative in the County for all matters relating to the Judiciary and the maintenance of law and order. 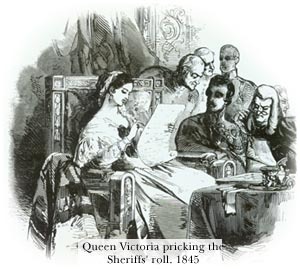 A High Sheriff on appointment swears an oath, which instructs the holder to "take command of the said County", and should they see anything untoward happening to inform "The Queen or Her Majesties Judges thereof". Therefore the post fits into our unwritten constitution as there is a person in each county that is a non-political appointment made by the Privy Council that only last for one year, is unpaid and therefore cannot be influenced for future benefit. As the only person in the civic circle that is non-party political they are well placed to keep an eye on the county to ensure that corruption and wrong practice can be identified and stamped out. The wellbeing and protection of Her Majesty's High Court Judges when on Circuit in the County and attending them in Court during the legal terms. Acting as the Returning Officer for Parliamentary Elections in County constituencies. The maintenance of the loyalty of subjects to the Crown. The Warrant of Appointment as High Sheriff remains valid even on the death of the Sovereign. In practice some of these responsibilities are delegated to the professional services, for example the protection of the Judges and the mainenance of law and order are in the hands of the Chief Constable of Police. The Monarch selects the names of the High Sheriff for each county from a list that is presented to her by the Privy Council. In Queen Victoria 's Reign, She was sewing and used her bodkin to mark the list. From then onwards the High Sheriff is always said to have been "pricked" when appointed. In common use is the term "to read the riot act", this is in fact a formal legal term that is still in use - if seldom used. In the County of Humberside (which existed from 1974 until 1996) the first High Sheriff, John Godfrey Fisher was asked by the police to read the Riot Act at Hull University. The cause was that the students had occupied the main admin buildings and had locked the doors! The Police had not the authority to break down the door and clear the building until the High Sheriff had read The Riot Act. With some trepidation Mr Fisher was driven to the University and stood exposed on the steps reading the Riot Act. As soon as he had finished the police rushed past him and broke down the door ending the occupation peacefully! The Riot Act has since been repealed. In one way or another, the sheriff has retained his interest, if not his responsibility for crime prevention right up to the present day. His responsibilities were handed over to the new constabulary of Sir Robert Peel in 1829 after more than eight hundred years of "preserving the King's peace." In the earliest days, the sheriff would pronounce sentence of outlawry with the words "let him bear the wolf's head." This meant that the outlaw could be hunted down and slain in the same way that marauding wolves were hunted. The sheriff could then raise "the hue and cry" officially known as the "posse comitatus" or power of the county. Not since 1830, when the sheriff of Oxfordshire raised the posse comitatus to help him quell riots over a hotly disputed enclosure award has the power been exercised. During the two World Wars the power to raise a posse in an emergency was re-invoked. Since then, however, the only remnant of this power to survive is the duty of the sheriff to read the Riot Act in the unlikely event of an insurrection against the Crown. Today, it is likely that the [English] sheriff would call upon the police if he required assistance in carrying out any of his remaining duties, including the protection of judges or the execution of writs. Our current Monarch is Her Majesty Elizabeth Alexandra Mary of Windsor, the elder daughter of King George VI and HM Queen Elizabeth the Queen Mother. - and the Supreme Governor of the Church of England. Although the powers of the monarchy are often seen as very limited, because the holder has the titles and positions above, it stops the tenant of No 10 Downing Street - The Prime Minister, from having the power that these positions contain. This often-underrated situation of negative power is of vital importance in our Constitutional Democracy as it ensures that politicians of all parties are operating under certain constraints not evident in many other countries.